Believe it or not, Mother’s Day is already right around the corner. Although you might have let it slip your mind in years past, 2019 is going to be different. This year, you’re going to go above and beyond, not procrastinate, and get a jump-start on gifts for mom. Besides taking her out to brunch (along with the millions of other people), here are a few adorable and unique gift ideas sure to put a smile on her face and put you at the top of her “favorite child” list. You know that obsession you have with getting a new bag at seemingly every opportunity? Yeah, you can probably thank your mom for that gene. Show your thanks for sharing the love of bag collecting with a new tote bag she can keep all of her daily essentials in. For Mother’s Day, get creative and browse a collection of cute bags to find the perfect one for her. Find something with a quirky and unique print that makes a statement in its own special way. 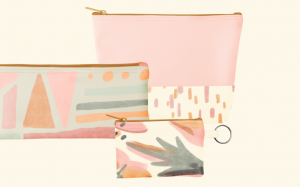 From cute, simple everyday totes for essentials to zippered totes and travel totes, get her something that she’ll want to use and pick a print or message that suits her style. While we’re firmly planted in the digital age shooting texts and emails back and forth, your mom probably still enjoys the satisfaction of writing her thoughts out by hand (in cursive no less) and sending letters and notes to friends through snail mail. A woman as important as your mom deserves her own cute stationery that adds a splash of color and excitement to her notes. Companies like Talking Out of Turn (TOOT) specialize in high-quality stationery, prints, and cards handcrafted by artists. Shop around and pick up a pack of stationery and make sure to get a gel pen or two also! They even sell stationery sets that come with everything mom needs to pen a letter, wrapped up and contained in a cute zippered pouch. If you’re looking for unique, artist-created products that make a statement in the office and your everyday life, then Talking Out of Turn (TOOT) has you covered. They are the crafty, handmade design experts that offer a variety of different stuff such as cute stationery, funny coffee mugs, tote bags, and even baby cards. What makes them unique (besides their cute, often sassy designs) is that they partner with artists to make their products by hand in their Dallas, Texas workshop. TOOT is a great place to pick up gifts for friends or special occasions, or to stock up on desk essentials and add another cute bag to your collection.